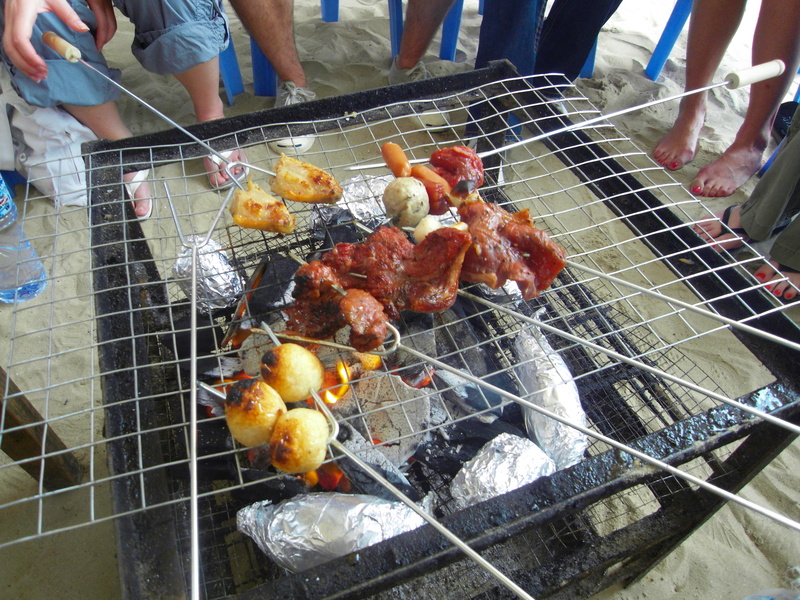 My friend P and I saw the Easter break as the perfect opportunity to combine the joys of the beach with a BBQ frenzy. 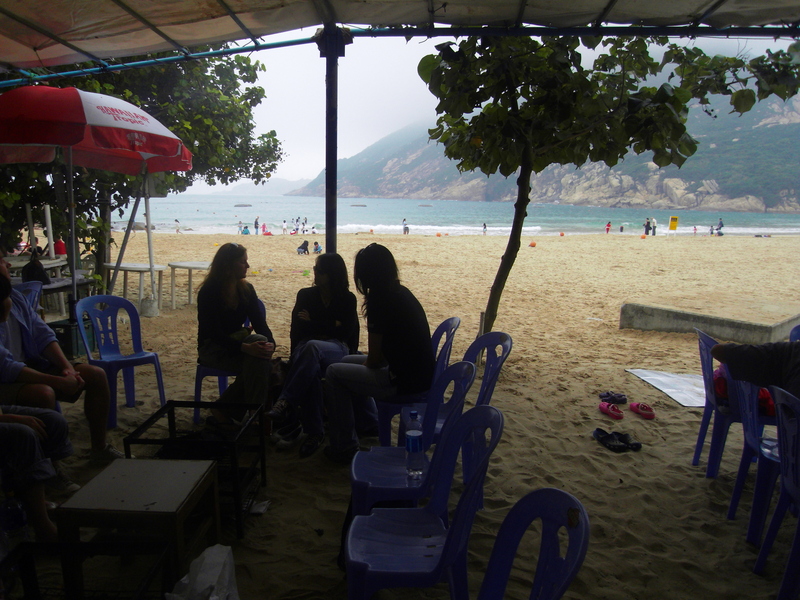 We organised a massive BBQ on Easter Monday at Shek O beach and rented a sheltered BBQ pit for 30 people. The beauty of renting these private pits is that you can take the easy way out and pre-order food and a drink for every person! So all we did was bring some extra drinks, snacks and our appetites. Annoyingly I caught a cough and a cold over Easter weekend and had partially lost my voice which meant I couldn’t go crazy BBQ’ing meat. 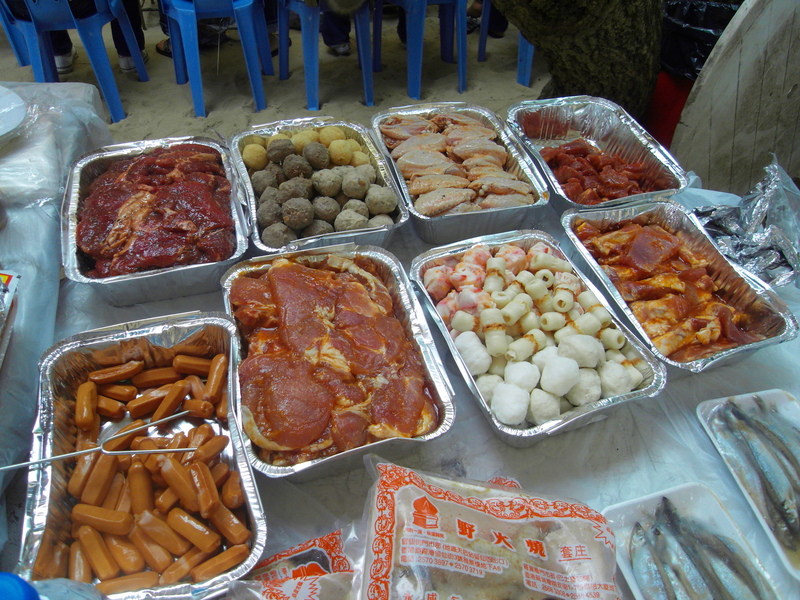 Instead I watched with amusement as people piled on their skewers with several varieties of meatballs, fishballs, sausages, chicken wings and cuts of beef and pork. 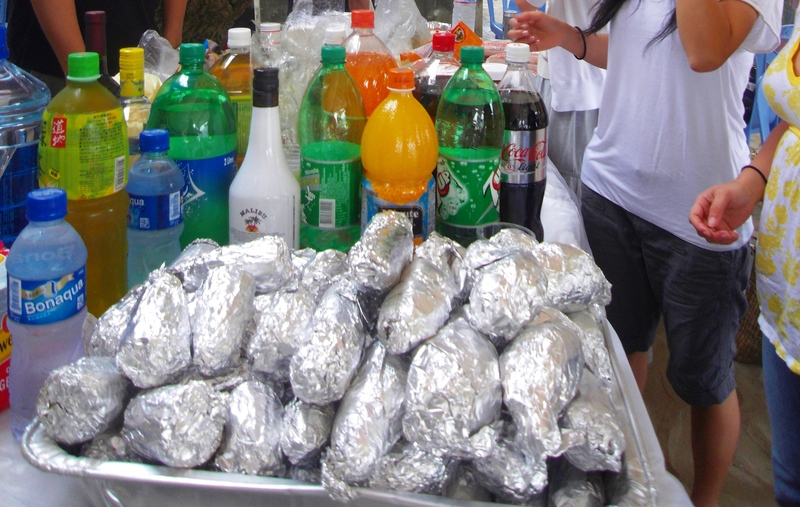 We also had an abundance of sweet potato and sweetcorn to get through which we placed around the coals. It looked like some had BBQ strategies, basting their meat with honey and lovingly turning the skewers over after a set period of time. 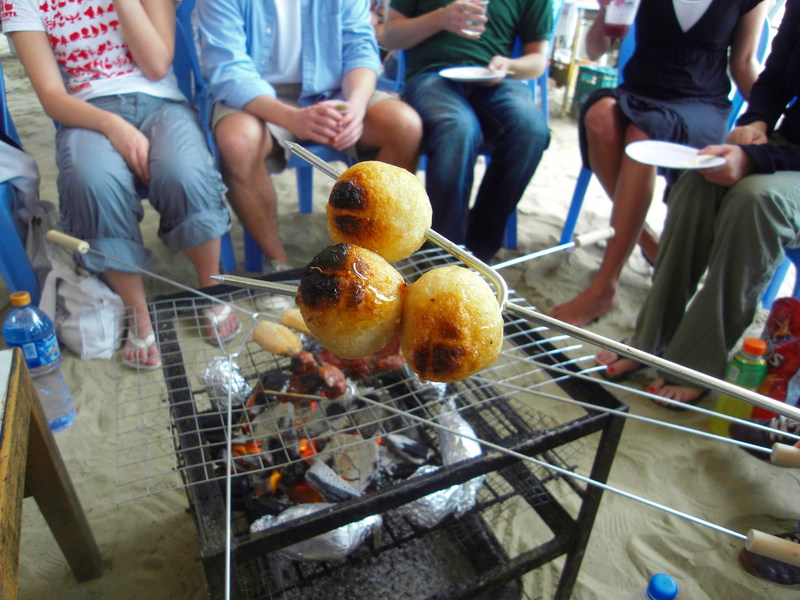 Other simply stuck their skewers on the BBQ net and watched for signs of charring! 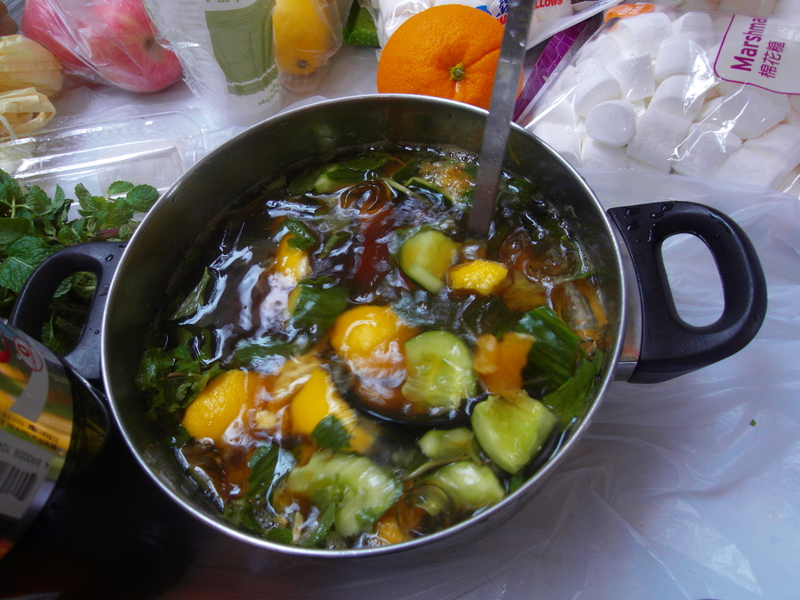 My friend W was the Pimms expert and whipped up the British tipple in my saucepan. 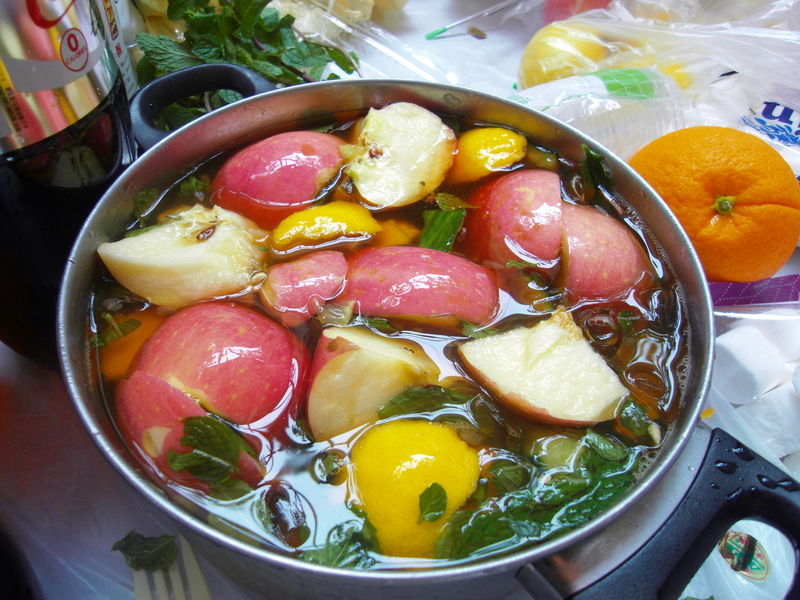 The cocktail was made with apples, oranges, lemons, mint, cucumber and lemonade. A variant can be made with ginger ale. 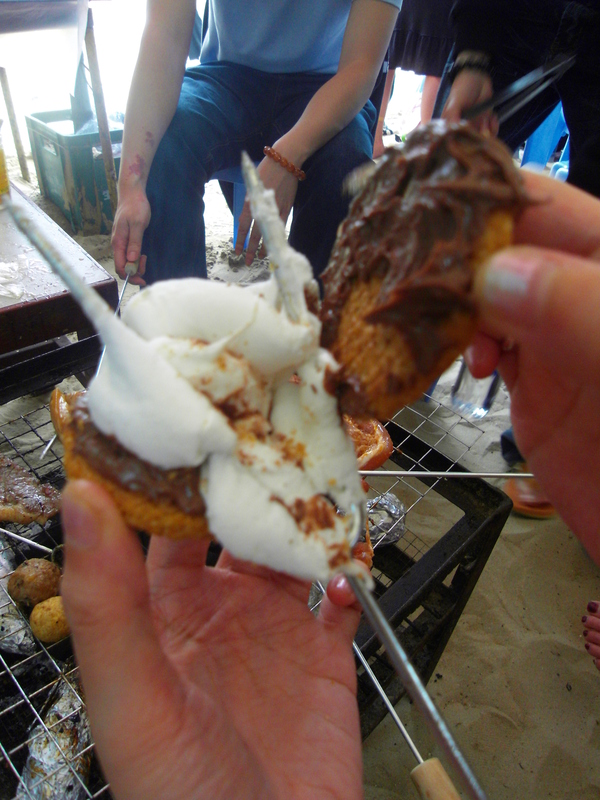 Another BBQ favourite was the roasting of marshmallows and the making of s’mores. 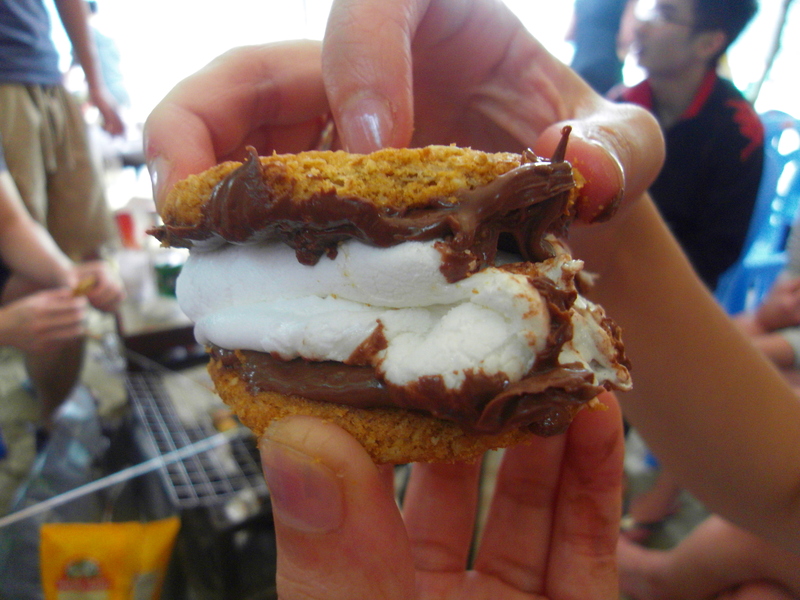 Traditionally, I’ve been told, a s’more is made from sandwiching a roasted marshmallow and a layer of chocolate between 2 pieces of graham cracker. 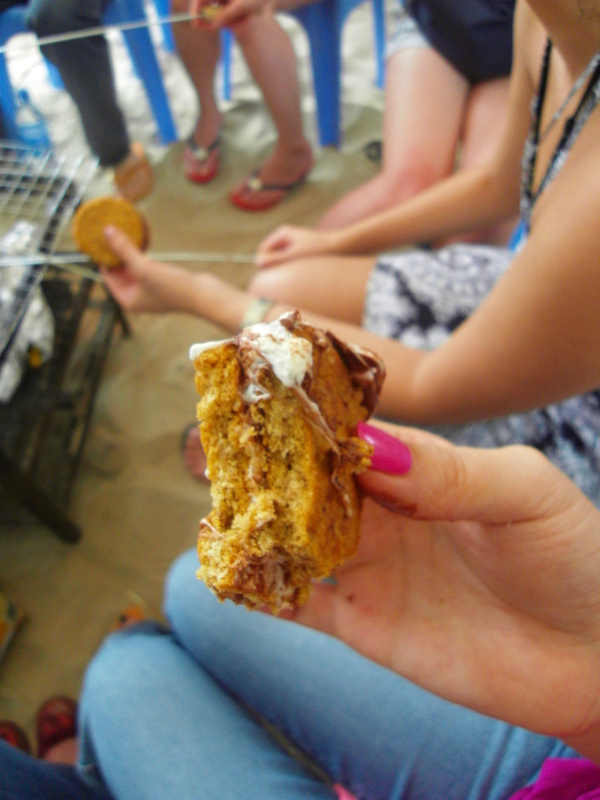 As we didn’t have graham crackers, some of the girls used chocolate digestives or plain digestive biscuits and nutella and then plonked a roasted marshmallow in between..yummmmmmm. 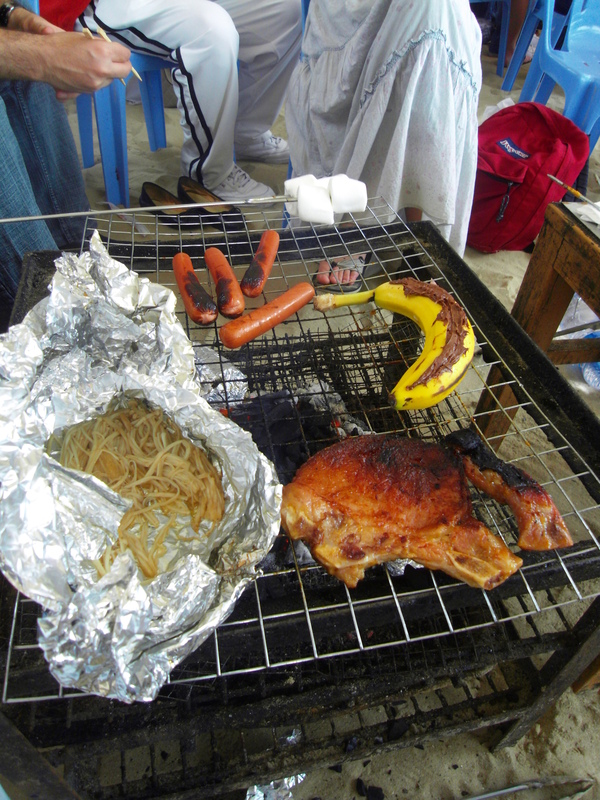 I also learnt how to do BBQ’d chocolate banana–>First, you make a vertical slit down the middle of a banana. Then you take a copious amount of nutella and smear it on the inside of the banana skin and over as much of the banana as possible. 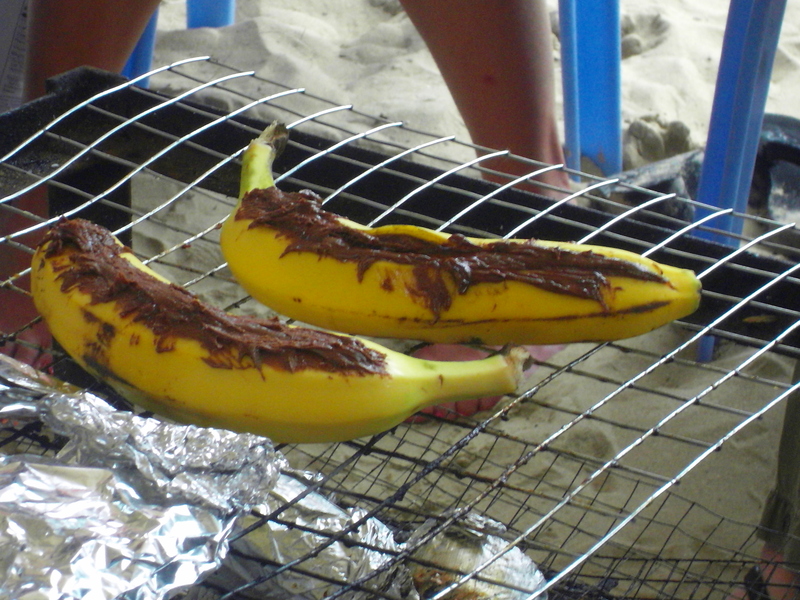 Next you close the banana skin, seal with more nutella and place the banana on the BBQ. What you get is a gorgeous yummy chocolate banana goo to stuff your face with. Nice! 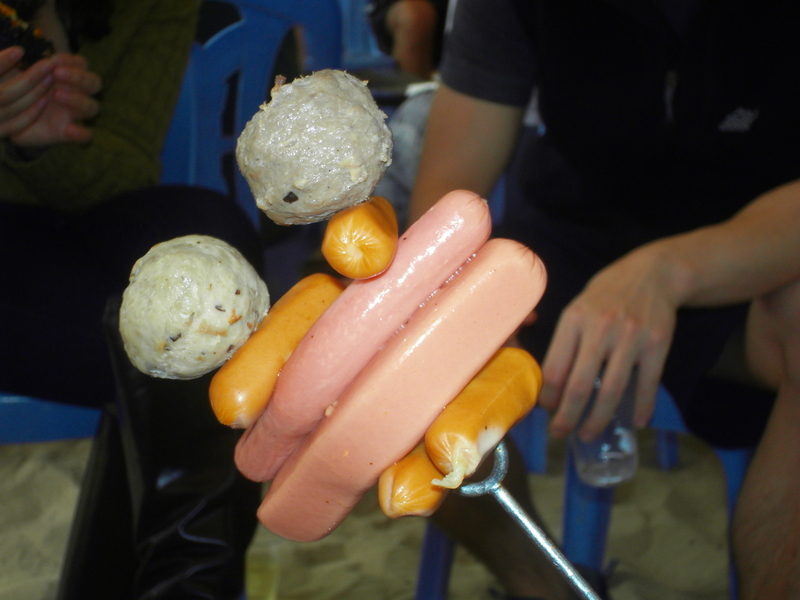 Chopstick rating: 5/5 ‘cos we LOVE BBQs! 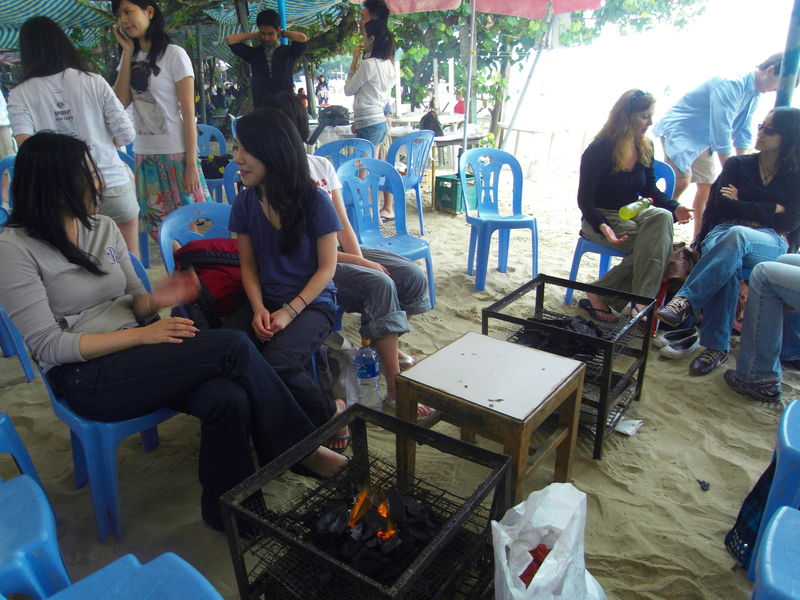 Categories: BBQ | Tags: BBQ pits, Pimms, S'mores, Shek O beach | Permalink.